Children's Treasure Hunt along the old Deeside Railway line at Cults. The local communitioes of Milltimber, Bieldside and Cults (MBC) hold a festival each year and the Rotary Club of Aberdeen Deeside supports the festival by holding an event. 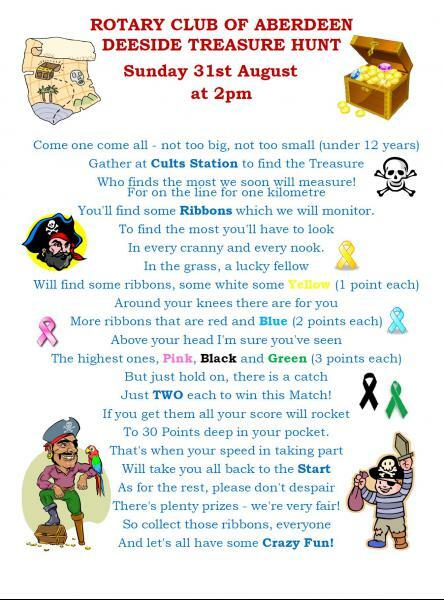 This year the event is again a children's Treasure Hunt along the old Deeside Railway Line from Cults Station. It will take place on Sunday 31 August from 2.00pm. The MBC Festival runs from Saturday 23 August to Wednesday 3 September. Click here to view the 2014 MBC Festival Programme.